Baru-baru ini hasil daripada penyelidikan dalam bidang genetik manusia mendapati bahawa faktor genetik mempengaruhi 8 ciri kuantitatif genetik bagi penduduk Asia (khasnya di Korea). Lapan ciri warisan tersebut ialah ketinggian, indeks berat badan, kadar denyutan jantung, tekanan darah sistolik, nisbah pinggang: punggung, densiti mineral tulang pada tibia (betis) dan tumit. Maklumat selanjutnya boleh didapati dalam artikel di Jurnal Nature Genetics (2009)…. To identify genetic factors influencing quantitative traits of biomedical importance, we conducted a genome-wide association study in 8,842 samples from population-based cohorts recruited in Korea. For height and body mass index, most variants detected overlapped those reported in European samples. For the other traits examined, replication of promising GWAS signals in 7,861 independent Korean samples identified six previously unknown loci. For pulse rate, signals reaching genome-wide significance mapped to chromosomes 1q32 (rs12731740, P = 2.9 times 10-9) and 6q22 (rs12110693, P = 1.6 times 10-9), with the latter approx400 kb from the coding sequence of GJA1. For systolic blood pressure, the most compelling association involved chromosome 12q21 and variants near the ATP2B1 gene (rs17249754, P = 1.3 times 10-7). For waist-hip ratio, variants on chromosome 12q24 (rs2074356, P = 7.8 times 10-12) showed convincing associations, although no regional transcript has strong biological candidacy. Finally, we identified two loci influencing bone mineral density at multiple sites. On chromosome 7q31, rs7776725 (within the FAM3C gene) was associated with bone density at the radius (P = 1.0 times 10-11), tibia (P = 1.6 times 10-6) and heel (P = 1.9 times 10-10). On chromosome 7p14, rs1721400 (mapping close to SFRP4, a frizzled protein gene) showed consistent associations at the same three sites (P = 2.2 times 10-3, P = 1.4 times 10-7 and P = 6.0 times 10-4, respectively). This large-scale GWA analysis of well-characterized Korean population-based samples highlights previously unknown biological pathways. Dengan terciptanya alat HaFYS yang berupaya mengesan DAN babi dengan tepat dalam makanan, sesungguhnya ia amat melegakan semua umat Islam yang selama ini terbelenggu dalam keraguan sama ada sesuatu makanan itu mengandungi unsur babi atau tidak, terutamanya di restoran, hotel, makan diproses, bahan makanan basah, dsb. Alat ini amat membantu JAKIM dalam menentukan kehalalan sesuatu makanan itu. Syabas dan tahniah diucapkan kepada para penyedilik di Institut Penyelidikan Produk Halal (IPPH), Universiti Putra Malaysia dan Pengarahnya Prof. Dr Yaakob Che Man, yang telah berjaya menghasilkan alat pengesan ini. Saya sebagai warga UPM tumpang rasa gembira dan berbangga dengan kejayaan IPPH ini. Semoga kejayaan ini akan berterusan demi untuk memaslahatan ummah Islam, bukan saja di Malaysia malahan di seluruh dunia. Perincian mengenai alat pengesan ini dipanjangkan dalam artikel berikut…. AWAL minggu ini, umat Islam digemparkan dengan berita sajian tidak halal yang disediakan kebanyakan kopitiam di negara ini. Pendedahan itu yang menyusuli laporan mengenai pasar raya menjual ayam tidak disembelih dengan sempurna, hanya mencetuskan kebimbangan ramai yang sudah pasti amat sensitif dengan isu halal haram makanan ini. Persoalannya, selain logo halal disahkan kerajaan, apakah ada cara lain dapat membantu menangani isu ini, khususnya mengesan kehadiran unsur babi dalam makanan? Jawapannya – alat HaFSY atau sistem pengesahan halal yang dibangunkan Institut Penyelidikan Produk Halal (IPPH) Universiti Putra Malaysia (UPM). Malah, pada tempoh terdekat ini, jika melihat pegawai agama atau anggota penguatkuasa Jabatan Kemajuan Islam Malaysia (JAKIM) membawa alatan berwarna hitam seperti pembakar roti, memasuki mana-mana restoran, kilang atau kedai runcit, jangan tersalah sangka, ia bukan untuk dijual sebaliknya itulah HaFSY. # Produk HaFYS pernah memenangi Anugerah Harta Intelek Negara 2009. # Hampir sama dengan teknologi mengesan denggi, malaria dan influenza. # Mempunyai primer dan probe yang pertama di dunia. Macam-macam kejadian Allah yang aneh dan luar biasa. Subhanallah, Maha Suci Allah daripada segala sifat kekurangan. Semua kejadian ada asbab dan musababnya dan ini dikatakan mengikut sunnatullah. Namun begitu, Allah juga menunjukkan kebesaranNya dengan mempamerkan keanehan dan kelainan daripada sunatullahNya. 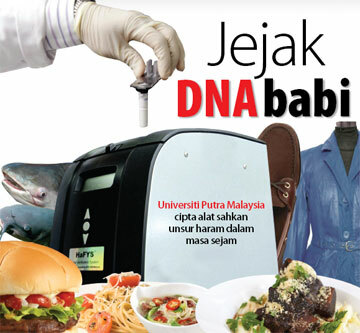 Ini terjadi disebabkan oleh kelainan susunan DNA (gene)/kemalangan genetik yang akhirnya menghasilkan berbagai keanehan dan keadaan luar biasa…. With a 13-inch tail, Chandre Oram, a tea-estate worker, has become quite an object of devotion in his native Alipurduar, West Bengal and believes that Hanuman is manifest in him. “I was born on Ram Navami (birthday of Lord Ram). People have a lot of faith in me – they get cured of severe ailments when they touch my tail. I believe I can do a lot of good to those who come to me with devotion,” says the man, before whom thousands of people queue up each day to seek blessings. In a corner of the courtyard of his home, Oram has set up a small Hanuman temple, where he receives offerings on Ram Navami, which he later offers to the deity. However, because of the tail, Oram has found it difficult to get a bride. “Almost 20 women have turned down marriage proposals. They see me and agree to a match. But as soon as I turn around, they see my tail and leave. But I have decided I will marry the woman who accepts me and my tail. Or else, I’ll remain a bachelor like Hanuman,” he said. Oram’s family is proud of his tail and has turned down offers from doctors for its removal by surgery. “He will not survive without his tail. It has become part of his being, his existence,” said Rekha, his sister. Doctors say that true tails are rare. But they are located in the coccygeal end of the vertebral column whereas Oram’s tail shoots out from the lumbar region. “The coccyx is a vestige in humans and we stopped growing tails from that region a long time ago when we evolved from monkeys. Oram’s case seems an aberration, an offshoot of a congenital defect,” said eminent surgeon Dr B Ramana. The medical community reads the monkey man’s case as a spina bifida — a defect in the bone of the spine covered by a hole with lots of hair covering it. 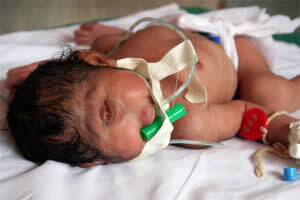 On 2006, this baby was born with a only one eye in India. Medical staff who helped deliver the child believe that the child’s condition was caused by an experimental anti-cancer drug. Another cause written in the report by the hospital was that it could also be the result of a chromosomal disorder. The child was diagnosed with a rare chromosomal disorder, known as cyclopia. She was born with a single eye in the center of her forehead, no nose and her brain fused into a single hemisphere. 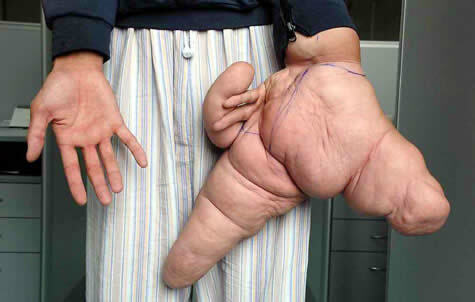 With such severe deformities, it was a miracle that the girl survived even a few minutes after delivery. The baby died days later. Lui Hua suffers from a rare condition known as macrodactyly. When he was hospitalized in Shanghai on July 2007, his left thumb measured 10.2 inches and his index finger measured close to 12. 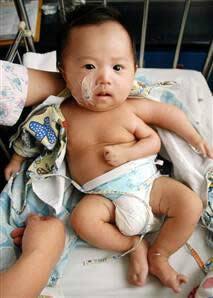 On July 20 surgeons undertook a seven-hour operation to reduce the size of Liu’s fingers and thumb. Doctors removed 11 pounds of flesh and bone in the procedure. A second surgery is scheduled to take place. Enlarged limbs can be caused by a number of medical conditions. Lymphedema is perhaps the most common cause and results in some extraordinarily enlarged limbs. Botak selalu dikaitkan dengan keguguran rambut yang berlebihan daripada kebiasaan, menjadikan rambut di kepala semakin hari semakin menipis…. Walaupun botak dikaitkan dengan orang lelaki, tetapi sesetengah perempuan pun menghadapi masalah serupa. Mungkin ada kaitan dengan genetik. Sebelum mencegah atau merawat masalah keguguran rambut, kita harus memahami maklumat asas mengenai perkara ini. Maklumat asas tentang botak dan faktor-faktor yang berkaitan dikongsi di bawah ini…. Hair grows everywhere on the human body except on the palms of our hands and the soles of our feet, but many hairs are so fine they’re virtually invisible. Hair is made up of a protein called keratin (the same protein in nails) produced in hair follicles in the outer layer of skin; as follicles produce new hair cells, old cells are being pushed out through the surface of the skin at the rate of about six inches a year. The hair you can see is actually a string of dead keratin cells. The average adult head has about 100,000 to 150,000 hairs and loses up to 100 of them a day; so finding a few stray hairs on your hairbrush is not necessarily cause for alarm. * Anagen — active hair growth. Lasts between two to six years. * Catagen — transitional. Lasts two to three weeks. * Telogen — resting phase. At the end of the resting phase (two to three months) the hair is shed and a new hair replaces it and the growing cycle starts again. Gradual thinning of hair with age is a natural condition known as involutional alopecia. More and more hair follicles go into a telogen, or resting, phase, and the remaining hairs become shorter and fewer in number. In men, the condition is also called male pattern baldness. It’s characterized by a receding hairline and gradual disappearance of hair from the crown. 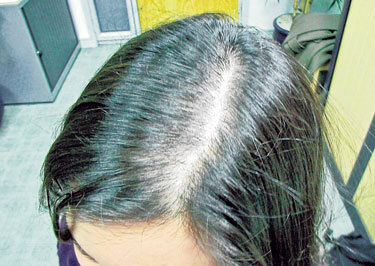 In women, androgenic alopecia is referred to as female pattern baldness. Women with the condition experience a general thinning over the entire scalp, with the most extensive hair loss at the crown. Patchy hair loss in children and young adults, often sudden in onset, is known as alopecia areata. 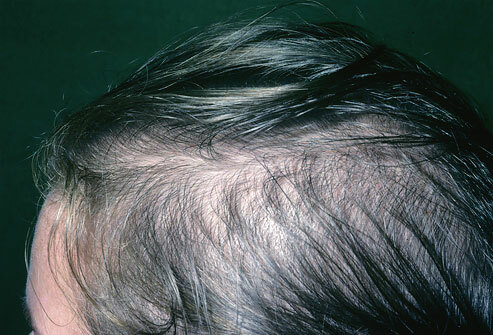 This condition may result in complete baldness, but in about 90% of cases the hair returns, usually within a few years. With alopecia universalis, all body hair falls out. Tearing out one’s own hair, a psychological disorder known as trichotillomania, is seen most frequently in children. Telogen effluvium is hair thinning over the scalp that occurs because of changes in the growth cycle of hair. A large number of hairs enter the resting phase at the same time, causing shedding and subsequent thinning. Doctors do not know why certain hair follicles are programmed to have a shorter growth period than others. Although a person’s level of androgens — male hormones normally produced by both men and women — is believed to be a factor, hair loss has nothing to do with virility. An individual’s genes, however — from both male and female parents — unquestionably influence that person’s predisposition to male or female pattern baldness. Telogen effluvium is temporary hair loss that can occur within a few months after a high fever, a severe illness or extreme stress, and in women following childbirth. Drugs that can cause temporary hair loss include chemotherapy drugs used in cancer treatment, blood thinners, retinoids used to treat acne and other skin problems, beta-adrenergic blockers used to control blood pressure, and birth control pills. Hair loss can also be caused by burns, X-rays, and scalp injuries. In such cases, normal hair growth usually returns once the cause is eliminated. 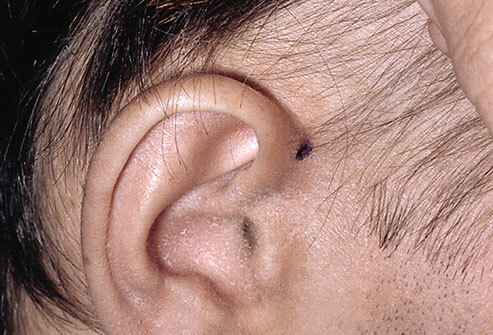 Ringworm caused by a fungal infection can also cause hair loss. The causes of alopecia areata, a disease that often strikes children or teenagers, remain unexplained. It is thought to be an autoimmune disease, meaning that the immune system revs up for unknown reasons and affects the hair follicles. In most cases the hair grows back, although it may be very fine and possibly a different color before normal coloration and thickness return. Although shampooing too often, perms, bleaching, and dyeing hair do not cause baldness, they can contribute to overall thinning by making hair weak and brittle. Tight braiding and using rollers or hot curlers can damage and break hair, and running hair picks through tight curls can scar hair follicles. In most instances hair grows back normally if the source of the problem is removed, but severe damage to the hair or scalp sometimes causes permanent bald patches. 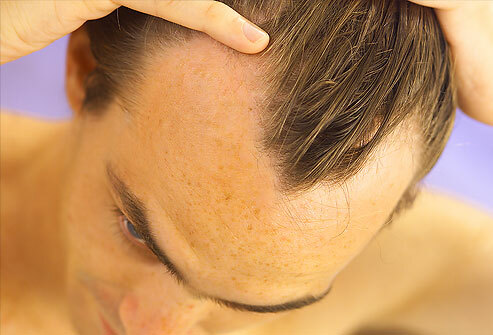 In the most common type of hair loss, inherited hair loss (androgenetic alopecia), men tend to lose hair on the front hairline and forehead and on top of the head. Eventually, only hair around the ears, the sides, and back of the head remains. Women with this condition typically have gradual thinning throughout the scalp. Other causes of hair loss may also show distinct patterns. For example, conditions such as trichotillomania (compulsively pulling at the hair) or alopecia areata (in which the immune system attacks hair follicles ) result in obvious patches of hair loss, while stress and some medicines result in clumps of hair falling out. Telogen effluvium (TE) is probably the second most common form of hair loss dermatologists see. It is a poorly defined condition; very little research has been done to understand TE. In essence though, TE happens when there is a change in the number of hair follicles growing hair. If the number of hair follicles producing hair drops significantly for any reason during the resting, or telogen phase, there will be a significant increase in dormant, telogen stage hair follicles. The result is shedding, or TE hair loss. Read more about hair loss basics. Botak juga boleh dikaitkan dengan gen yang diwarisi daripada ibu bapa atau datuk nenek/salsilah keturunan masing-masing. Nasihat-nasihat berguna daripada pakar-pakar kecantikan tempatan berkaitan masalah botak ini juga dimuat dalam artikel Kosmo yang dikongsi di bawah ini…..
SETIAP kali menyisir rambut, hati Muzliana Safuan, 27, pasti merintih. Umpama igauan ngeri, ikal rambutnya yang gugur semakin banyak, rambutnya semakin menipis sekali gus mendedahkan bahagian tengah kepalanya. “Sudah banyak cara saya lakukan untuk melebatkan rambut. Daripada penggunaan syampu berjenama terkenal, tonik rambut berasaskan herba, petua tradisi hingga ke rawatan pakar tetapi semuanya gagal. “Keadaan ini sangat merisaukan lebih-lebih lagi saya bakal mendirikan rumah tangga beberapa bulan lagi. Mujur, saya memilih untuk bertudung sejak sekolah, jadi hanya keluarga dan kawan rapat yang mengetahui masalah saya,” kata Muzliana. Tambah penjawat awam tersebut, masalah tersebut menyebabkan dia berasa kurang yakin untuk berhadapan dengan bakal suami dan keluarga mentua. Masalah keguguran rambut ekstrem bukan sahaja dirasai Muzliana tetapi ramai lagi wanita mengalami episod ngeri itu. Bagi individu yang berpegang kepada konsep rambut mahkota wanita, mereka pasti ghairah untuk memiliki rambut yang sihat dengan gaya terkini. Menjawab masalah keguguran rambut tersebut, Presiden Persatuan Sains Rambut Malaysia, Dr. Steven Chow berkata, menjaga rambut tidak cukup dengan hanya bersyampu tiga kali seminggu. Jelas beliau, kulit kepala juga memerlukan perapian dan vitamin yang cukup untuk kekal sihat tanpa sebarang masalah seperti kegatalan, kelemumur dan jangkitan kuman. “Ramai pihak beranggapan silap memilih syampu, pengambilan serbuk perasa (monosodium glutamate) dalam masakan serta faktor penuaan sebagai sebab utama keguguran rambut, namun itu hanya penyebab sampingan. “Realitinya, tekanan (stress) dalam kerjaya atau kehidupan menjadi pencetus kepada masalah keguguran rambut yang serius terutama membabitkan golongan lelaki,” jelas Steven. MASALAH botak bukan hanya terhad kepada lelaki tetapi wanita turut mengalami fenomena sama. Menurut beliau, pola keguguran rambut lelaki (MPHL) yang biasa terjadi pada kaum Adam sering dikaitkan dengan faktor genetik. “Mungkin ramai tidak menyangka botak tiada kaitan dengan faktor genetik, tetapi hakikatnya, keturunan kerap menjadi punca keguguran rambut. “Ia boleh diwarisi daripada sebelah ibu atau bapa dan boleh berlaku terhadap lelaki ataupun wanita. Kedua-duanya cenderung untuk mewarisi gen botak,” ujar Steven. Akibat daripada warisan gen rambut gugur tersebut, individu terlibat berisiko tinggi untuk berdepan masalah keguguran rambut yang mampu menipiskan rambut namun tidak semuanya berakhir dengan botak. Namun, keadaan yang dikenali sebagai androgenetic alopeciaini boleh bermula pada usia belasan tahun, 20-an atau 30-an. Dalam satu kajian jelas Steven, hampir 50 peratus anak-anak kepada lelaki atau wanita botak akan mewarisi gen tersebut. “MPHL terjadi secara berperingkat-peringkat. Masalah itu bermula dari kawasan tengah kepala, ia mampu merebak hingga ke seluruh kepala. Ramai lelaki memilih untuk berdiam diri dan tidak berasa ia satu keperluan untuk berjumpa dengan doktor hanya kerana masalah rambut semakin menipis. “Malah, lebih 80 peratus lelaki tidak tahu apa itu MPHL dan menganggap ia berlaku kerana faktor usia sedangkan masalah ini tidak akan melarat jika dirawat daripada awal,” katanya. Steven menyarankan individu yang mengalami MPHL mendapatkan rawatan berkesan dengan menangani punca asas masalah tersebut. Masalah keguguran rambut yang berisiko terjadi kepada setiap orang berkenaan turut mendorong ramai penyelidik untuk tampil menjalankan kajian. Antaranya, beberapa ahli akademik dari dua universiti di Jerman iaitu Universiti Bonn dan Universiti Dusseldorf menjalankan kajian mengenainya. Mereka mendapati gen botak sememangnya diwarisi. SELEBRITI Britney Spears membotakkan kepala kerana ingin membuat kejutan manakala Syarifah Amani membotakkan rambut untuk memenuhi kehendak skrip filem yang dilakonkannya. Sekumpulan penyelidik di Victoria, Australia mendapati, keguguran rambut di bahagian tengah dan hadapan kepala meningkat selari mengikut usia. Ia memberi kesan sehingga 57 peratus wanita dan 73.5 peratus kepada lelaki yang berusia 80 tahun ke atas. Laman sesawang Perpustakaan Medem Medical turut melaporkan, kira-kira 40 juta lelaki di Amerika Syarikat berdepan dengan masalah MPHL. Menurut laman tersebut, seorang daripada empat lelaki mulai botak pada usia 30 tahun, dua pertiga mulai botak pada usia 60 tahun ke atas. Tambah laman itu, nisbah untuk mendapat gen botak adalah empat dalam setiap tujuh orang. Selain tekanan dan faktor genetik, faktor pemakanan tidak seimbang, penyakit tiroid, masalah sistem imunisasi, pengambilan dadah atau ubat-ubatan tertentu, kurang penjagaan rambut, trauma dan jangkitan kulit kepala boleh menyumbang kepada keguguran rambut dan botak. Pertumbuhan rambut individu dewasa yang dipengaruhi oleh hormon seks iaitu androgen boleh mengalami fasa pertumbuhan di antara dua hingga enam tahun dengan kepanjangan kira-kira 0.35 milimeter (mm) sehari. Selepas fasa tersebut, proses pertumbuhan akan berehat untuk beberapa bulan. Rambut yang sihat dan normal memiliki beberapa ciri khas seperti berkilat, mudah lentur, tidak mudah patah dan boleh menyerap air. Keguguran rambut di antara 50 hingga 100 helai sehari adalah normal namun jika ia tidak dipantau, keguguran mungkin akan menjadi lebih serius lebih-lebih lagi jika individu tersebut berada dalam kelompok berisiko tinggi untuk botak. Jika terdedah kepada persekitaran kotor dan berhabuk, kulit kepala yang sering gatal boleh mendapat jangkitan kuman atau alahan kepada bahan kimia. Sekiranya dibiarkan tanpa rawatan, ruam akan timbul dan bagi kes serius, gelembung berisi air kesan daripada radang kulit akan terbentuk. Pada peringkat ini, individu tersebut boleh mengalami kebotakan serius. RAMBUT palsu sering menjadi pilihan terutamanya membabitkan wanita dalam menyembunyikan masalah rambut masing-masing. Sementara itu, Ketua Trikologi Pusat Rambut Svenson, Teo Kim Teik berpendapat. untuk mendapatkan rambut yang sihat, amalan mengambil makanan seimbang sangat penting. “Meninggalkan diet secara keterlaluan boleh menyebabkan keguguran kerana hampir 90 peratus komponen rambut terdiri daripada protein. “Diet yang tidak sihat dan kurang mengambil protein akan menjadikan rambut lemah dan mudah gugur. Banyakkan pengambilan zat seperti kalsium dan zink kerana ia boleh menyihatkan rambut,” katanya. Penjagaan kebersihan dan kesihatan rambut juga tidak boleh diabaikan. Rutin bersyampu sekurang-kurangnya dua kali seminggu dan pemilihan sikat yang sesuai mampu mengurangkan risiko keguguran rambut. 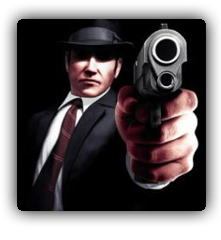 Is there a gangster gene? Is There a Gangster in Your Genes? Al Capone, Jack the Ripper and Ted Bundy. Three of many larger-than-life personalities infamous for their violent, and in some cases murderous, behaviour. The MAOA gene codes for the enzyme monoamine oxidase-A. It is located on the X chromosome and is primarily responsible for the degradation of amine neurotransmitters, such as dopamine, norepinephrine and serotonin. These neurotransmitters control mood, aggression and pleasure. What is even more interesting is that low expression of the MAOA gene has now been linked to violent tendencies. A recent study reported that males with low expression levels of the MAOA gene were about twice as likely to have used a weapon or joined gangs than ‘normal’ boys. The research focused on males because the MAOA gene is carried on the X chromosome, hence males only have one copy. Thus, males who possess a variant of the MAOA gene do not have a second copy to counteract any errors. Interestingly, some common inhibitors of MAOA include tobacco and drugs used to treat depression and Alzheimer’s. This increases the importance of accurate and specific measurement and monitoring of MAOA gene expression in high-risk category individuals. If the level of expression of the MAOA gene can be measured, then an estimation of the likelihood of an individual getting involved in violent activities can be made. Although it would not be possible to change a violent individual’s DNA, it could be feasible to alter the level of gene expression using a suitable miRNA or transcription factor. To measure the expression level of MAOA in males, a suitable probe has to be designed; one that is specific for the MAOA gene. 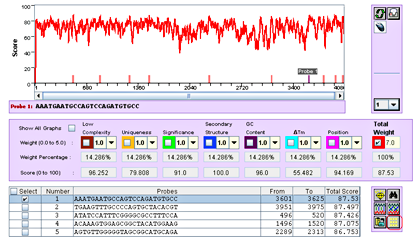 SynaProbe is a cutting-edge online tool that designs and selects suitable oligomer probes for a gene of interest, in this case, MAOA. It is most effective when complemented with SynaHybridise, an application that verifies the specificity of the selected probe sequence. On the results page, click on to verify probe sequence specificity. The result demonstrates that the selected probe is specific if it has no permutations. With 3 mismatches it will bind to other chromosomes. Assume that type O blood is found at the crime scene. Type O occurs in about 45% of Americans. If investigators type only for ABO, finding that the “suspect” in a crime is type O really doesn’t reveal very much. In this way, by accumulating bits of linking evidence in a chain, where each bit by itself isn’t very strong but the set of all of them together is very strong, you can argue that your suspect really is the right person. With DNA, the same kind of thinking is used; you can look for matches (based on sequence or on numbers of small repeating units of DNA sequence) at many different locations on the person’s genome; one or two (even three) aren’t enough to be confident that the suspect is the right one, but thirteen sites are used. A match at all thirteen is rare enough that you (or a prosecutor or a jury) can be very confident (“beyond a reasonable doubt”) that the right person is accused. Scientists find the markers in a DNA sample by designing small pieces of DNA (probes) that will each seek out and bind to a complementary DNA sequence in the sample. A series of probes bound to a DNA sample creates a distinctive pattern for an individual. Forensic scientists compare these DNA profiles to determine whether the suspect’s sample matches the evidence sample. A marker by itself usually is not unique to an individual; if, however, two DNA samples are alike at four or five regions, odds are great that the samples are from the same person. If the sample profiles don’t match, the person did not contribute the DNA at the crime scene. All mothers have the same mitochondrial DNA as their offspring. This is because the mitochondria of each new embryo comes from the mother’s egg cell. The father’s sperm contributes only nuclear DNA. Comparing the mtDNA profile of unidentified remains with the profile of a potential maternal relative can be an important technique in missing-person investigations. The answer to this question is based on information from Using DNA to Solve Cold Cases – A special report from the National Institute of Justice (July 2002). Identifying the victims of the September 11, 2001, World Trade Center attack presented a unique forensic challenge because the number and identity of the victims were unknown and many victims were represented only by bone and tissue fragments. At the time of the attack, no systems were in place for rapidly identifying victims in disasters with more than 500 fatalities. The National Institutes of Justice assembled a panel of experts from the National Institutes of Health and other institutions to develop processes to identify victims using DNA collected at the site. Panel members produced forms and kits needed to enable the medical examiner’s office to collect reference DNA from victims’ previously stored medical specimens. These specimens were collected and entered into a database. The medical examiner’s office also received about 20,000 pieces of human remains from the World Trade Center site, and a database of the victims’ DNA profiles was created. New information technology infrastructure was developed for data transfer between the state police and medical examiner’s office and to interconnect the databases and analytical tools used by panel members. In 2005 the search was declared at an end because many of the unidentified remains were too small or too damaged to be identified by the DNA extraction methods available at that time. Remains of only 1585, of the 2792 people known to have died had been identified. In 2007, the medical examiner’s office reopened the search after the Bode Technology Group developed a new methodology of DNA extraction that required much less sample material than previously necessary. The victim DNA database and the new methods have allowed more victims to be identified, and further identifications will be possible as forensic DNA technology improves. Numerous people (known as “the Disappeared”) were kidnapped and murdered in Argentina in the 1970s. Many were pregnant. Their children were taken at birth and, along with other kidnapped children, were raised by their kidnappers. The grandparents of these children have been looking for them for many years. Read an article about a DNA researcher who has been helping them. PARIS, Apr 19, 2000 (Reuters) — Scientists cracked one of the great mysteries of European history by using DNA tests to prove that the son of executed French King Louis XVI and Marie-Antoinette died in prison as a child. Royalists have argued for 205 years over whether Louis-Charles de France perished in 1795 in a grim Paris prison or managed to escape the clutches of the French Revolution. In December 1999, the presumed heart of the child king was removed from its resting place to enable scientists to compare its DNA makeup with samples from living and dead members of the royal family — including a lock of his mother Marie-Antoinette’s hair. The Ice Maiden was a 12-to-14-year old girl sacrificed by Inca priests 500 years ago to satisfy the mountain gods of the Inca people. She was discovered in 1995 by climbers on Mt. Ampato in the Peruvian Andes. She is perhaps the best preserved mummy found in the Andes because she was in a frozen state. Analysis of the Ice Maiden’s DNA offers a wonderful opportunity for understanding her genetic origin. If we could extract mitochondrial DNA from the Ice Maiden’s tissue and successfully amplify and sequence it, then we could begin to trace her maternal line of descent and possibly locate past and current relatives. In southern Africa, a people known as the Lemba heed the call of the shofar. They have believed for generations that they are Jews, direct descendants of the biblical patriarchs Abraham, Isaac, and Jacob. However unlikely the Lemba’s claims may seem, modern science is finding ways to test them. The ever-growing understanding of human genetics is revealing connections between peoples that have never been seen before. Using DNA fingerprinting techniques akin to those used to solve crimes and settle paternity suits, scientists at the University of California, Davis, have discovered that 18 of the world’s most renowned grapevine varieties, or cultivars are close relatives. These include varieties long grown in northeastern France such as Chardonnay, the “king of whites,” and reds such as Pinot and Gamay noir, are close relatives. A woman was murdered in Prince Edward Island, Canada. Her estranged husband was implicated because a snowy white cat hair was found in a jacket near the scene of the crime, and DNA fragments from the hair matched DNA fragments from Snowball, the cat belonging to the husband’s parents. See M. Menotti-Raymond et al., “Pet cat hair implicates murder suspect,” Nature, 386, 774, 1997. Also see Holmes, Judy, Feline Forensics, Syracuse University Magazine, Summer 2001. The first case in which a murderer was convicted on plant DNA evidence was described in the PBS TV series, “Scientific American Frontiers.” A young woman was murdered in Phoenix, Arizona, and a pager found at the scene of the crime led the police to a prime suspect. He admitted picking up the victim but claimed she had robbed him of his wallet and pager. The forensic squad examined the suspect’s pickup truck and collected pods later identified as the fruits of the palo verde tree (Cercidium spp.). One detective went back to the murder scene and found several Palo Verde trees, one of which showed damage that could have been caused by a vehicle. The detective’s superior officer innocently suggested the possibility of linking the fruits and the tree by using DNA comparison, not realizing that this had never been done before. Several researchers were contacted before a geneticist at the University of Arizona in Tucson agreed to take on the case. Of course, it was crucial to establish evidence that would stand up in court on whether individual plants (especially Palo Verde trees) have unique patterns of DNA. As more offender DNA samples are collected and law enforcement officers become better trained and equipped to collect DNA samples at crime scenes, the backlog of samples awaiting testing throughout the criminal justice system is increasing dramatically. In March 2003 President Bush proposed $1 billion in funding over 5 years to reduce the DNA testing backlog, build crime lab capacity, stimulate research and development, support training, protect the innocent, and identify missing persons. For more information, see the U.S. Department of Justice’s Advancing Justice Through DNA Technology. * CODIS: Combined DNA Index System – Information from the FBI. * The FBI Laboratory’s Combined DNA Index System Program – Enter regional information to learn more about CODIS in your area. From Promega Corporation, a major supplier of reagents and other materials to support molecular biology research. * National Commission on the Future of DNA Evidence. * Postconviction DNA Testing: Recommendations for Handling Requests – Report from the National Commission on the Future of DNA Evidence. * What Every Law Enforcement Officer Should Know About DNA Evidence (September 1999) – Report from the National Commission on the Future of DNA Evidence. * Slide Show: Forensic DNA Legislation 2002 – A look at states’ CODIS legislation. Collected samples are stored, and many state laws do not require the destruction of a DNA record or sample after a conviction has been overturned. So there is a chance that a person’s entire genome may be available —regardless of whether they were convicted or not. Although the DNA used is considered “junk DNA”, single tandem repeated DNA bases (STRs), which are not known to code for proteins, in the future this information may be found to reveal personal information such as susceptibilities to disease and certain behaviors. In the United States each state legislature independently decides whether DNA can be sampled from arrestees or convicts. In 2006, the New Mexico state legislature passed Katie’s Bill, a law that requires the police to take DNA samples from suspects in most felony arrests. Previous New Mexico laws required DNA to be sampled only from convicted felons. The bill is named for Katie Sepich, whose 2003 murder went unsolved until her killer’s DNA entered the database in 2005 when he was convinced of another felony. Her killer had been arrested, but not convicted, for burglary prior to 2005. Opponents of the law assert that it infringes on the privacy and rights of the innocent. While Katie’s Law does allow cleared suspects to petition to have their DNA samples purged from the state database, the purging happens only after the arrest. Civil liberties advocates say that Katie’s Bill still raises the question of Fourth Amendment violations against unreasonable search and seizure and stress that the law could be abused to justify arrests made on less than probable cause just to obtain DNA evidence. * Major crimes often involve people who also have committed other offenses. Having DNA banked potentially could make it easier to identify suspects, just as fingerprint databases do. * Innocent people currently are incarcerated for crimes they did not commit; if DNA samples had been taken at the time of arrest, these individuals could have been proven innocent and thereby avoided incarceration..
* Banking arrestees’ DNA instead of banking only that of convicted criminals could result in financial savings in investigation, prosecution, and incarceration. * Arrestees often are found innocent of crimes. The retention of innocent people’s DNA raises significant ethical and social issues. * If people’s DNA is in police databases, they might be identified as matches or partial matches to DNA found at crime scenes. This occurs even with innocent people, for instance, if an individual had been at a crime scene earlier or had a similar DNA profile to the actual criminal. * Sensitive genetic information, such as family relationships and disease susceptibility, can be obtained from DNA samples. Police, forensic science services, and researchers using the database have access to people’s DNA without their consent. This can be seen as an intrusion of personal privacy and a violation of civil liberties. * Studies of the United Kingdom’s criminal database, which retains the DNA samples of all suspects, show that ethnic minorities are over represented in the population of arrestees and are, therefore, overrepresented in the criminal DNA database. This raises the concern of an institutionalized ethnic bias in the criminal justice system. * Even the most secure database has a chance of being compromised. To identify individuals, forensic scientists scan 13 DNA regions, or loci, that vary from person to person and use the data to create a DNA profile of that individual (sometimes called a DNA fingerprint). There is an extremely small chance that another person has the same DNA profile for a particular set of 13 regions.